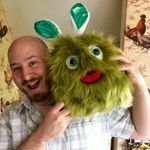 Richard Tiernan is a designer and an artist for board games and also the founder of Questing Creatures. Most recently he created and successfully funded the card game Colossal Blob on Indiegogo. Colossal Blob was one of the top five finalists for Hasbro's Great Game Challenge of 2016!